The shop recently got in a really lovely collection of Easton Press books. Some real beauties. In that collection was this little set of poetry books. They are on the smaller side, four inches by seven inches, with a flexible leather cover. They still have all the details of the larger Easton books; moire endpapers, silk ribbon bookmark, etc. - just in a smaller form. As it turns out, we had doubles of many of the little poetry titles, so I am offering these twelve for this week's giveaway. Good luck, it's one of the best collections I've given away! Oh, and don't forget about my holiday book sale post - still lots of good ones left, and I am still updating the list. I love these .. would love to win them! Please include me in the giveaway! Thank you! I may have already submitted, but it never showed that it went thru. That is, quite literally, the most darling set of books I have ever laid eyes on ~ and I've seen quite a few book sets! Happiest of holly jolly weekends everyone! Beautiful! Please add my name to the drawing. They would look lovely in my curio cabinet. Lovely... I could definitely manage to negotiate a spot on my over-crowded shelves for these books (not an easy diplomatic task, BTW). Beautiful collection. I would love to be entered. Thank you. Absolutely beautiful! 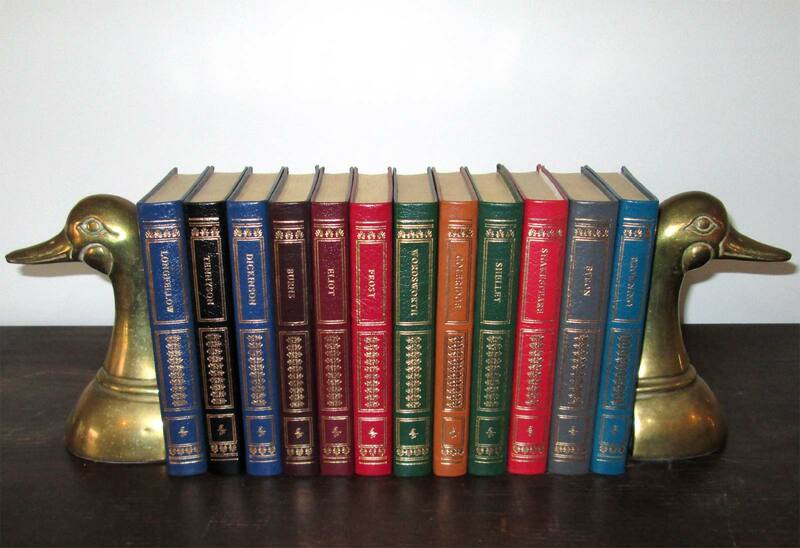 I have a number of Easton Press books and would love to add these to my collection. Thanks for the giveaway! I am a bookseller, also. I also love books that are small in size. And I have those SAME DUCK BOOKENDS! I love these! Pretty books like these are what I call "shelf candy." Can I please have them? please? I am such a poetry lovere...these would be wonderful to have. Now these are books I would love - Poetry occupies a large space on my book shelves. Please include me in this giveaway ...Thank you. Ooo these are gorgeous. It would make such a great Christmas present! Synchronicity...it's been a poetry day! Would love to be included in this giveaway. Thank you so much for the chance! Another handsome giveaway. Thanks for the chance. Aw, you had me at "matched Poetry volumes" - please throw my name in the hat! A very beautiful collection!! Whoever wins it will truly be blessed with a magnificent gift! Oh my!!! Maybe I'll win this time! Good luck everyone. This is a wonderful giveaway!!! These are little beauties! I'm sure they have as much beauty inside as they do on the outside! Wow. Something I could take to read at my next chemotherapy session. Would love to win this beautiful collection and have you send it on to my good friend who is a total poetry fanatic and would adore receiving these books. What a fabulous collection! I love poetry and would be so happy to have them....and give them a very good home! Thanks! Oh, I hope I win! I would love to sit down and read them to my grands, I have gotten them hooked on books! Yea!! !